Listen to the sounds of the beautiful people singing. I took this short video at the place where we fed the hungry in Dire Dawa, Ethiopia. Ahhhhmazingly grateful for so little! 250 families with 4 generations. 150 school kids grades 1st-5th. In 1 dirt floored room. With clean water so much could change for this village. They would have water to drink. To irrigate fields of agriculture. They can then sell food from the crops for income. They become self sustainable long term. No longer reliant on others. They do not know what tomorrow brings. They don't want a hand out, they want a hand up. All I need is 25 sponsors of $12.00 per month and we can transform this village. Will you partner with me and the GHNI TCD ? You CAN be the change. You CAN make a difference. Harar, one of the four holy cities. A beautiful city on the hillside. Located about 1 1/2 hours outside of Dire Dawa. The city is known for commercial production of Harar coffee. Unfortunately, another small town just outside of Harar is also known for chat. Chat is a narcotic much like marijuana (but legal) that is sold to many in Ethiopia and although it takes more time to grow and harvest chat, it makes more money than selling coffee beans. Many fields that once were coffee fields are now fields of chat. On Monday we had the opportunity to visit a coffee bean plantation. Hilu, the plantation owner, was gracious to have us. We were able to meet with him and all the families that lived in the village. 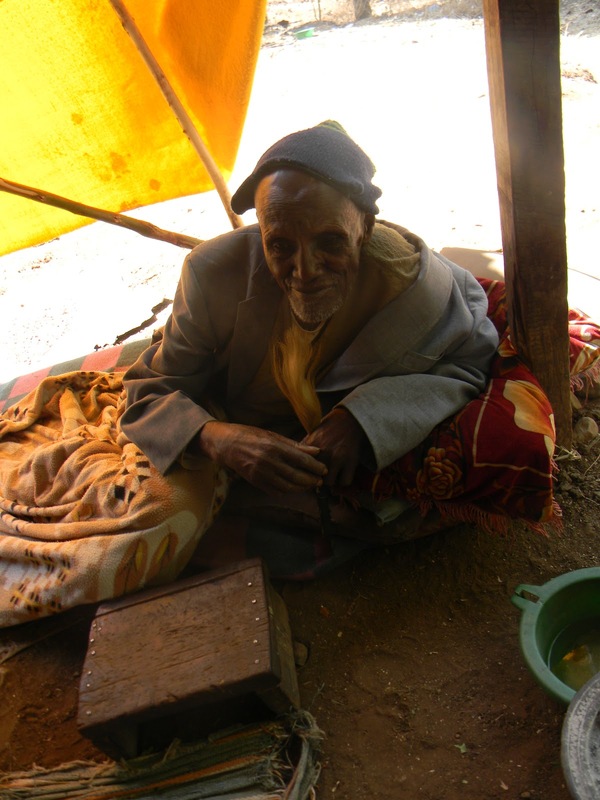 Jeff Power, one of our GHNI leaders, recorded a video with the plantation owner to put on his blog about how the exporters of Harar coffee need to pay more money per kilo to the farmers so they are no longer reliant on chat to help make ends meet. The average income of the families in this village is 6 to 10 birr a day which equals to less than $1.00 USD. The current exchange rate is 17 birr to our $1.00. Imagine supporting your family with that little amount of money. One of the families shared with me their twin babies. One thing all of us women noticed while we were on this trip is how loving and affectionate the people of Ethiopia are. They have no problem showing affection whether that be hugging, holding eachother around the waist, holding hands, putting their arms around another. They were not shy. And they love their pictures to be taken. After taking each picture, we would show the child or adult what the picture looked like on the camera screen. Many in the far of villages had not seen a picture of themselves. Mirrors are unheard of as is vanity for that matter. You can see the coffee trees behind in this picture. I never knew that coffee actually grew on trees. I always thought that they grew on bushes. After visiting the village we were able to go into the City of Harar and visit the spice market. We also had a traditional dinner and participated in a coffee ceremony. I will post more about this later along with some more pictures. Tomorrow we will be going to Megdali again. Thursday we will be in Garmaam and Friday in Hurso. Do you have any questions you want me to ask of the people in the villages? On Sunday our team went to a local orphanage in Dire Dawa. Unfortunately, due to safety reasons I can not post any pictures on the internet. The orphanage has children from the age of 6-19. Many of them have been abandoned by their parents for various reasons. A few live their because their parents are deceased; having been persecuted for their Christian beliefs. The orphanage provides them with the stability that so many of them need. They also provide them with a warm bed, food, clothing, education and UNCONDITIONAL LOVE. This is one of the smaller orphanages in Dire Dawa and it was not what I expected. This was not the typical orphanage that many people think of; that I thought of. When I think of an orphanage I think of many children packed into a *dark and dingy* large room with one *mother* to too many children. Children eagerily vying for your attention, anyones attention for that matter. This orphanage was not like that. It was more like a large family. The children there were actually a bit apprehensive when we arrived. Not knowing what we were there for. Unsure of our intentions. They were happy. They were settled. This was their home. After taking a tour of the orphanage we were able to partake in their church service. The church service was held in a large empty room. Upon entering we had to remove our shoes. We sat on mats throughout the room. Their service was very similar to ours. They started out with several songs of worship. At one point we all stood up and sang Father Abraham. This was great fun. The children loved this. Their faces lit up as we all danced to the song. Some of us not knowing all the moves and looking silly. Before moving into the verse that we studied, we were able to tell them what brought us there and how the LORD has worked in our heart. I shared with them how truly blessed I felt to be there with them and how this had always been a dream and now that I am here immersed in their culture it was more than I dreamt and thanked them for having me. And from there we read several passages from the bible. We studied Matthew 5 and discussed conflict resolution. Many of the children chimed in on how to resolve conflict. It was very impressive some of the ideas that they shared. They were very open minded. More open minded than I would say some of the American children I know. They *get* forgiveness. They know the LORD wants them to be humble rather than righteous. They know that is is ok to swallow your pride. To love those that have even done you wrong. As I surveyed the villagers as we were exiting the jeep I felt an overwhelming instant connection. Many of the women that stood before me were mothers, mothers of all ages of children. Small babies, toddlers, grade schoolers and a few tweens. They were just like us. It didn't matter that we couldn't understand them nor them us. A warm smile is all it took. Since there was an obvious communication barrier we decided to show them photos of our own family. This really helped break the ice, they could now see that we were just like them. After leaving the village and processing my feelings for a little bit it *hit* me. It doesn't mattter where in the world you are. People are people. We all have the same needs, wants and desires. The people of Megaladi they want to be sulf sufficient. They want to be able to support their families. They want their children to be educated. They want to have clean water to drink and be able to provide them with food. Things that seem easily attainable to many but are not so easy for them. This is where Global Hope Network International comes in to bring help and hope to the hidden and the hurting by TRANSFORMING these villages step by step in these 5 key areas. In the Megaladi Village they have a water pump that they are able to run about once a week which provides the villagers with water for consumption, for cooking and washing. Unfortunately, most of the water is high in salt so they can only drink the water so much before it effects their kidneys. However when this is the *cleanest* water you have especially during the dry months, they willingly drink it. And because of current lack of irrigation or training for agriculture, food is scarce. With the lack of clean water and proper nutrition, the villagers health suffers greatly. They have no real sustainable income generation nor do the children have access to education. Most of the children have to help the families haul water, cut wood to sell in the city, scavenge for food to clean and sell at the market and therefore do not have the opportunity to go to school. As you can see Megaladi needs help. And if WE, you and me along with GHNI can get even just one of these items crossed off it would have a great impact on the other 4. They can use it for drinking (without the risk of becoming ill). They can use it for irrigation for crops to grow their own food. They can use some of the food as a source of ongoing income. No longer will the children have to help their families, instead they can be children and go to school to become educated...thus helping break the cycle of poverty. Here is where you can come in. We need 25 donors to sponsor the village. To sponsor all you need to do is sign up to donate $12 per month and with your help you can transform this village. $12 a month is all it takes. (That is the cost of a Starbucks Venti Mocha and a Breakfast Sandwich 2x a month). Interested in being part of something that will transform the lives of many? Go here to sign up. We are officially in Dire Dawa*, Ethiopia. What a long trip so far. After two days of traveling it was time to relax and regroup. Which is exactly what we did at our guesthouse, African Village. Our host is named Siggy and he is originally from Switzerland but now makes his home here in Dire Dawa. He built most of this guesthouse himself. It has tons of beautiful craftsmanship. Check out the video to see where we will be calling home for the next week. We had a quiet day with lots of visiting and getting to know our leaders Jonathan and Jeff from GHNI, the other volunteers, Laura, Heather and Cortney and our hosts. Mapping out the next week of our African journey. It was beautiful and sunny 85 degrees or so. Ahh sunshine. Love the vitamin D. We don't get much of that in the parts of the world that I am from at this time of year. This is a real treat. We have an African Village Ambassador. Meet Lola. She is fluent in dog, cat and pretty much everything else. We have been joking that we were going to teach her, Copacabana. I wasn't able to get any really good pictures in Addis Ababa last night or today since it was dark but on our way home we will have several hours before our flight leaves that we will do some exploring in the big city. Here is a picture of the airplane that we took from Addis Ababa to Dire Dawa. Smaller plane. We were packed in there like sardines. I took this picture as I was walking into the Dire Dawa International Airport (lol) and I was questioned by a man holding an AK 47. Apparently, they don't like pictures taken of airplanes, government buildings, etc. Who knew? You bet I do now. Here is a picture of the jeep that we rode to the guesthouse in and our driver putting all of our luggage on top. The little blue car that you see in this picture is called a Bajaj and is like our taxis in the states. The cost varies depending on where you are going but since Dire Dawa is pretty small you can get from one side of the town to the other for hecka cheap. We had lunch at the guesthouse restaurant. I had a dish with beef, carrots and potatoes in a tomato based sauce with injera. Injera is a spongy flat bread that you use to scoop up your food with instead of utensils. It was made fresh and so so good. Tonight at dinner we went to a traditional restaurant in the city and had a family style dinner where we all shared the food off the same big plate. On this plate there were several types of tib which is chunks of sauteed meat. You take the injera, dip into the sauce or charro (kinda like a refried bean) and then scoop up some of the tibs. There is also salad with an oil dressing that you can add into the mix. Mouth watering delicious. And all the food that we had which fed 9 of us, easily, only cost like $30 American dollars. $466 birrs. The exchange rate right now is 17 birr to our dollar. This was taken right out in front of our guesthouse, packing mules, packing wood to take to a nearby village. It is getting late here. I am 11 hours ahead so it is about 1130pm. I better hit the hay. Big day tomorrow. First day in the field. I will post some more pictures tomorrow night which will be tomorrow morning for most of you. Hope you come back to read more of this adventure of a lifetime. *Dire Dawa is in the northeast part of Ethiopia. I typed this while I sat on the plane on my way to Amsterdam. Unfortunately, the plane didn't have internet access nor could I use my iphone...Gasp. So here I sit typing this post in word to then copy and paste into a post when I deplane. Hoping that there will be free wi fi that I can connect to really quick so I can give everyone back home a quick shout that I landed. I guess we shall see. Wow, this is a long flight. Not as long as I thought but never the less. A long flight. They had a few movies showing. Moneyball, I have already seen so I opted to read my book instead. Almost done. I have been meaning to finish reading it so what better time than while locked in a plane at 35000 feet, right? Lord, knows I can't sleep. Nope, not a wink at this point and almost half way to Amsterdam. The sandman is not calling my name. My eyes hurt because I have had insomnia the last couple nights but just can't get comfortable. I even have most of a row to myself too but nothing. It is so boring on the plane I don't even have any interesting people watchin stories. I was so hoping I would but I got nothing. Everyone is snoozing, but me. I have always said sleeping is overrated but I am sure when I land that is when I am going to crash and burn. Ought to be funny to see. Yeah, not really. Update on the people watching : shortly after I typed this I walked in on a yiddish woman going to the bathroom. (You know Ya Ya). Not sure who was more embarrased me or her. And then this lady in the row in front of me started smacking her face all over. I think maybe she was trying to wake herself up? I don't know. I found it a little odd. But that is just me. I subjected myself to playing some video games on the computer out of pure boredom. I DON'T play video games EVER...I still don't but when you are bored, you often times will do things you don't typically do. I played Pac Man for awhile. I remember playing Pac Man as a kid on Atari. Remember those? I am a child of the early 80's (I just aged myself, huh?). Oh well what can I say. I didn't do to well then nor did I do to well now. I think my video playing days are over. They are going to be playing the Ideas of March soon. I am looking forward to watching that movie. Wanted to see that movie but never got around to it. That is the movie with Ryan Gosling and George Clooney (I think). Ryan Gosling. That is all I will say about that. He was in that movie Drive. Husband and I went to see it awhile back. Not a huge blockbuster but a good movie, a little bit graphic. I really loved Cary Mulligan in it. She has such an innocent quality about her that in all the movies I have seen with her. I just want to hug her and tell her everything will be ok. LOL. If you can handle some graphic scenes I would say see it. Drive that is. I will let you know how Ideas of March is later. Definetly a darker film for pretty boy, clean cut Ryan Gosling. Update on movie: They didn't play the movie with Ryan Gosling and George Clooney. They played Water for Elephants instead. Ho hum movie. I don't really care for RPat. I like Reese Witherspoon but this role was very minor at best. My computer and phone are still on Portland time. This time change thing is really going to mess me up, IT IS really messing me up. It is almost midnight here as I finish this post and I feel like I should be awake and have an early morning wake up call. The drive from the airport was interesting. No stop lights, no stop signs, just a free for all. Biggest car or van wins. It wasn't too busy on the roads since it was about 1030pm by the time we started our drive to the hotel. Our hotel that we are staying at is in a shanty part of town but it is one of the nicer hotels, I hear. There was a long, dark and windy road to get here. And pedestrians, they don't move. They just walk where ever and the cars are suppose to go around them. We can hear all the wild dogs howling from our balcony. They are not too far off in the distance. Kinda neat sounding, yet scary too. I am going to sign off for now. Tomorrow we will have some time to post some pictures and share some more. I am leaving a delightful paradise; my Eden. All that I know; leaving all my comforts behind. As I type this I am sitting at the airport getting ready to board my plane for my trip to Ethiopia. I have just left my friends and family, all that I am, behind in Portland, Oregon to travel to an unfamiliar place far, far, away. When I walked through the security gate leaving my family, watching them wave goodbye and Hayden, my very inquisitive silly boy, doing somersaults, my heart leapt into my throat knowing that I would not be seeing them for two weeks. Two weeks seems like a lifetime right now. I know in a day or so I am going to thirst for my babies and my husband. To touch them, to smell them, to hold them, to love on them. I have never been away from my family for this long. My husband said it best in a text he sent me not to long after they left the airport: "You are my breath, part of me is gone. 1-4-3"
I am missing them already and I am not even off the ground. 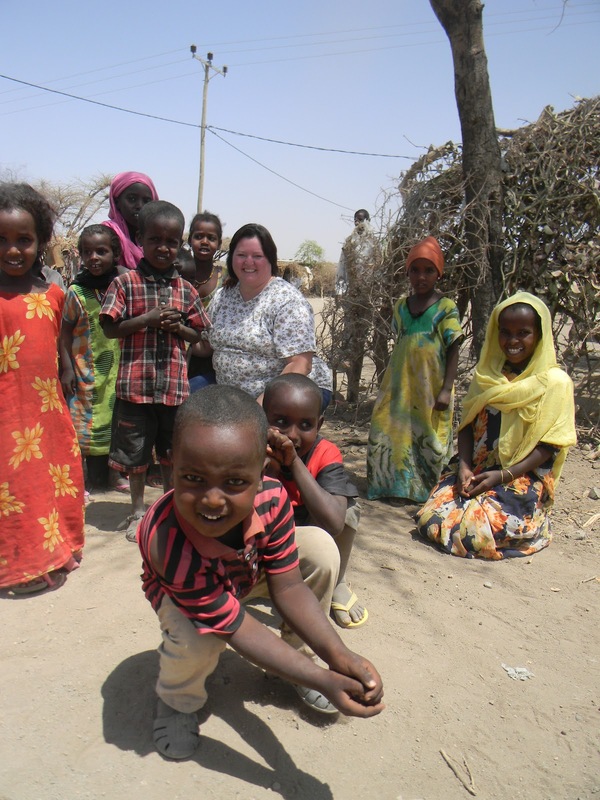 As you read this post, Jenn is probably winging her way across the world to Ethiopia, how I envy her. She’s living her dreams and doing something meaningful. When she asked me if I was interested in doing a guest post while she’s away, I was both honoured and a little concerned to start with. Concerned because Jenn has an amazingly popular blog and a huge following; because that’s the sort of person she is. The funny thing with Jenn and I is that over the months we’ve discovered just how much we have in common and how similar we are. The blogosphere is amazing like that, it stands to reason that the blogs you read or follow are going to be the ones that appeal to you because the owner has similar thoughts and values, as well as goals and challenges you identify with. I have a number of regular blogs I visit because of these types of connections, but Jenn is like the sister I never had or someone I’d probably become friends with in real life. Ironically she also lives in a town in the US which was a big part of my teenage memories. I divide the blogs I visit into three different groupings – those I visit every day or two and comment on several times a week; those that if I have time I’ll visit and occasionally comment on; and those that I visit and never comment on because something makes me feel uncomfortable about commenting. What about you? – what makes you go back to a blog or become a regular follower? Is it because you form a connection with the owner, or they supply handy tips or useful projects, or simply because they make you laugh. I’m sure you’ll be back here this week with me eagerly waiting for Jenn’s stories and pics of her adventure. I wish her the best of luck. I would love to hear your thoughts and if you’re in my neighbourhood of the blogosphere, why not drop in and say hi. You can find her over at Inspiration To Dream. Please show her some blog love. You will not be disappointed, I promise! Thank you Fi for such kinds words. The feelings are mutual. You have truly been an inspiration with all your positive energy you are always sending not just my way, but everyones way. In light of my trip to Ethiopia that I am leaving for tomorrow, I made several freezer meals for my family to enjoy while I am away. Cook pasta 3-4 minutes less than what is instructed on package. Drain. Mix together soup and milk. Stir in pasta, cheese, tuna, and peas. Place in freezer bag. Label and freeze. To serve: Thaw and bake covered in greased casserole dish for 40 minutes at 350. Uncover. Crunch up Ritz Crackers or Croutons and layer on top of casserole. Bake for another 10 minutes. Cook pasta 3-4 minutes less than what is instructed on package. Drain. Combine cheese, soup and sour cream. Stir in pasta and ham. Place in freezer bag. Label and freeze. To serve: Thaw and bake in greased casserole dish for 45 minutes at 350. Cook chicken til golden brown. Combine chicken broth and butter in pot on med heat. Stir in stuffing. Combine sour cream and soup. Mix into stuffing. Add cooked chicken. Stir. Place in freezer bag. Label and freeze. To serve: Thaw and bake covered in greased casserole dish for 30 minutes at 350. Uncover. Bake for another 20 minutes. I am linking up with Not Just A Housewife Show Me What Ya Got and 33 Shades of Green Tasty Tuesday. Unfortunately because I was a cooking fend for about 3 hrs on Sunday afternoon, I did not take pictures. Since I was bagging it up, it was not all that pretty anyways (but sure does taste good). Sorry. 1. Cook mushrooms in butter for 5 minutes. Remove from pan. 2. Brown ground beef with diced onion. 4. Return mushrooms to ground beef with onion. 5. Stir in soup, sour cream, salt & pepper. 6. Place in freezer bag, label and freeze. To serve. Thaw. Heat in pan until smooth and hot. If you need to thin it a little bit add a little milk or sour cream. Serve over egg noodles. I am linking up with I'm An Organizing Junkie for Menu Plan Monday. Although, I have planned menus the last couple weeks, I have not linked up. Life kind of got away from me. These next two weeks will be a bit unusual. I will not be around for dinners for the next two weeks. I am off to Ethiopia on Wednesday morning. Read more about that here. I have prepared several freezer meals for my MIL who will be helping my husband with the kids while I am away. These are in no particular order but wanted to share what I made along with the recipes. I will post these recipes in separate posts so check back shortly. I then stocked the refrigerator and made a list of several other easy to prepare meals for grandma to whip up. If you are new to my blog, make sure to check back these next two weeks to share in my journey as I travel to Ethiopia. I will be sharing lots of stories and pictures of the people in the villages that I meet. Welcome to the $700 Winter Blast of Cash Giveaway hosted by Giveaway Promote. I have teamed up with a fantastic group of bloggers to give away $700 in cash to one lucky person. Check out the list of participating blogs at the end of this post. Complete the tasks below to earn entries into this giveaway. One winner will be chosen at random from all valid entries. Bloggers, join us in an upcoming event! Sign up for Giveaway Promote's event mailing list to receive information via email about their future events. Everyone keeps asking, are you ready? Are you packed? Do you have everything? Are you scared? Are you nervous? And I say, "I am as ready as I will ever be." I am sure I will forget something. I am sure I will forget to do something at work and all heck will break lose. I am 150% certain that the house is not as organized and as clean as I would like it to be before I leave. But I am heading out the door to yonder parts of the world regardless. I am a bit nervous for the long flight. I am a bit anxious for leaving my family. I am a bit scared for the adventure I am about to embark on. But I am heading out the door to yonder parts of the world regardless of all my uncertainty, fears, anxieties. I have been given an opportunity that not to many people get and I am going to make the best of it. And that is all that I can wish and hope for. I am not going to eradicate extreme poverty. I am not going to change the world. Cure cancer. But I will hopefully change a few lives of the people in the villages I meet. And I am 150% certain I will be changed forever. New to my blog? Want to know where I am going? Read this or this. It is the final countdown. I will be leaving on a jet plane in just under a week to an unknown land. A land on the other side of the world. A land filled with strife and unfulfilled needs that I can not even fathom to imagine. But I will not have to imagine for much longer. I will be there walking along side of the people of Garmaam and Hurso sharing their stories. The stories of their needs, their desires, their dreams, their happiness, their sadness. I will be sharing it all. The good, the bad and the ugly. I hope you all come with me on this journey. New to my blog? 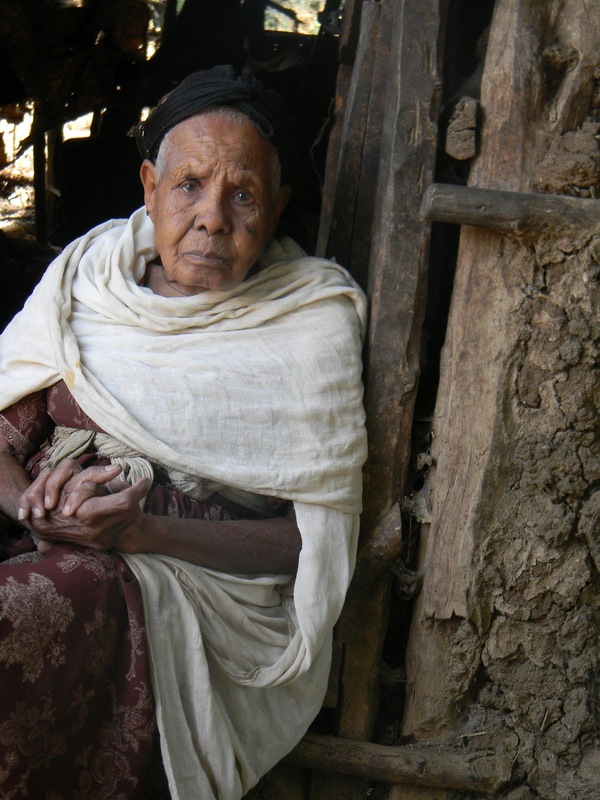 Want to read about what led me to take this trip to Ethiopia? Read this. 1. If I have to vacuum up another bowl of *dumped* cat food I am going to scream! Why oh why must my daughter like to dump the cat food almost every time? Really? 2. My to do list for things I need TO DO before I leave on my trip has reproduced like a rabbit. Seriously, the list is like two pages long and there is no possible way that I am going to get through everything. 3. I pulled out my luggage this past weekend and there it sits, empty, in our hallway for us to trip over. I know I still have some time to pack but I would really like to be organized and not procrastinate. Nice thought, huh? 5. I have only decided on 4 freezer meals for while I am gone, so far. Need help. Any ideas? I really don't want to be cooking all this weekend but I also don't want my family to eat out of a box or take out the whole time I am gone. Hmm, what to do. Maybe a frozen lasagna? Corn dogs? They would probably love that. Any confessions you want to share? Pretty please so I don't feel so alone.